Topsail Island North Carolina consists of 3 cities: Topsail Beach, Surf City and North Topsail Beach. Part of the island is in Onslow County and part of it is in Pender County. Topsail Island North Carolina is one of my most favorite places in the world. I stayed here for 15 years before finally sitting down one day and trying to figure out why it is sometimes called Topsail Beach, Topsail Island, Surf City, North Topsail and more. But, I got to the bottom of this burning question and I’m here to share the answer with you. 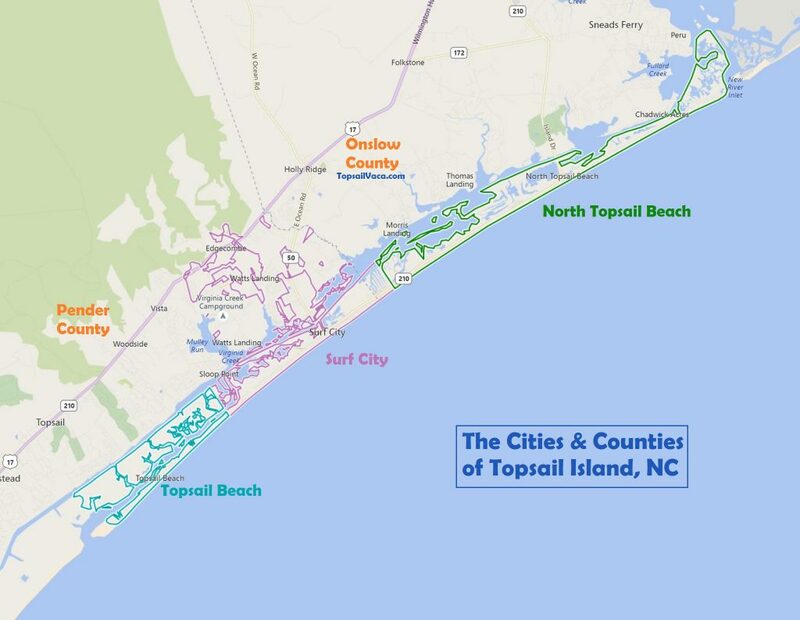 Topsail Island is a constantly changing, 26 mile long barrier island on North Carolina’s coast located 20mi above Wilmington and just south of Camp Lejune. But, there is no city called “Topsail Island”, Topsail Island is simply the name of the island itself. The island is split up into three cities; as mentioned above, those three cities are Topsail Beach, Surf City and North Topsail Beach. North Topsail Beach is in Onslow County, and the very top tip of Surf City is in Onslow County as well. The rest of Surf City and all of Topsail Beach are in Pender County. The image at the top of this article shows all of this visually! Surf City – Surf City is what most people think of when they are new to Topsail Island, but as explained above, Topsail Island does not equal Surf City. As seen in the image above, Surf City is technically both on and off the island and the municipality has some very odd property lines. When you enter Topsail Island via the swing bridge and cross the intracoastal waterway and hit the main strip, you’re in Surf City. Upon entering the island via the swing bridge you’ll see Sound Side Park on the right and Surf City Crab ahead on the left which sells fresh seafood. If you continue straight ahead you’ll run right into a beach access which is crowded on hot summer days and south of that is the Surf City Pier where I’ve caught many fish. If you travel South on the island you’ll be on S Shore Drive until you hit Topsail Beach where the road becomes N Anderson Blvd and if you go north on the island on the main street you’ll be on N New River Dr until you hit North Topsail Beach where the road becomes Island Dr. Surf City has several bait shops, and ABC Store, bars, grills, ice cream, restaurants, public beach access and much more. You can usually get an Uber or a Lyft in Surf City also. Topsail Beach – Topsail Beach is the southernmost town on Topsail Island. There are several rentals on this end of the island consisting of bungalows and larger beach houses for families and even multiple families. Driving is allowed at the southern end of the beach for fishermen only and residents get a discount. North Topsail Beach is home to the Jolly Roger Pier, South End Outfitters, The Gift Basket and multiple bars and grills. North Topsail Beach – Many people traveling to North Topsail Beach come in via Surf City, however, some come in via the bridge on 210. There are many residential homes on this section of Topsail Island which also features the same amenities as Topsail Beach. Traveling up New River Drive takes people to several hotels, beach access points and River Drive where there’s ORV Beach Access. All three of these towns have their own town halls, police departments, fire departments and more. I hope you found this helpful! I left out a lot about all of these great towns but if you have anything unique to contribute just leave it in the comments below!